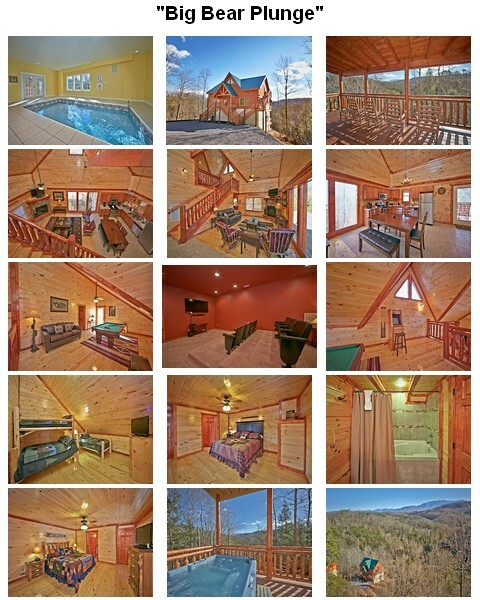 Just outside of Pigeon Forge, nestled in the hills of the Tennessee Smoky Mountains, is a 3-bedroom luxury rental cabin with its own indoor pool, as well as a home movie theater. This is “Big Bear Plunge”, sleeping up to 12 people in comfort, perfect for a small retreat gathering, a family reunion, or a group of friends on a mountain getaway. 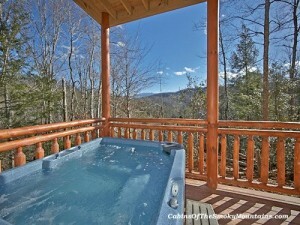 “Big Bear Plunge” offers beautiful views of the mountains and the unending forest terrain of the Smokies. This can best be enjoyed from the comfort of the hot tub on the covered lower deck! The lower deck fronts the indoor swimming pool, which connects to the home theater – it’s a popular floor of the 3-story cabin! Upstairs to the main level, two of the master bedrooms share the floor with the living area, dining area and full kitchen. This main level covered deck is a favorite spot to gather on rocking chairs and discuss matters of great importance – or perhaps just to rock in silence and watch the mountains. 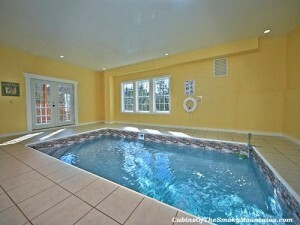 The top level of Big Bear Plunge houses the pool table and arcade games, with the third bedroom. Life in the cabin is pretty spread out, kids will be up and down the stairs, while grownups will find plenty of areas to settle and be absorbed. A fireplace in the living room hosts one of the 5 flat-screen TVs disbursed throughout the cabin. There are three full bathrooms, one with a jacuzzi. With the hot tub and swimming pool, Big Bear Plunge offers a water-wonderland experience, a very welcome and unusual experience in a mountain log cabin. 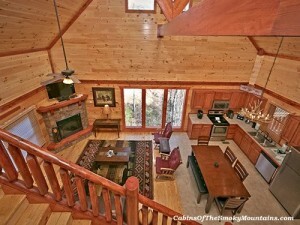 The amenities of this luxury cabin include hi-speed wifi and premium cable, as well as washer/dryer and charcoal grill. Conference center and wedding facility access are included with the cabin. Downtown Pigeon Forge is a few minutes away, with all of its many attractions. Even so, they’ll have to compete hard to budge you from the cabin’s massive “stay-put” factor, the relaxing pleasure of simply hanging out and enjoying being there. Click here to check availability and book Big Bear Plunge for your next trip!